This suite of Excel add-ins for quantitative analysis, along with its accompanying tutorial documentation, provides Monte Carlo simulation, decision trees, queuing simulations, optimization, Markov chains, and forecasting. "INSIGHT 2.0 is a must read..."
"It's like taking candy from a statistician." Simple yet powerful Monte Carlo Simulation for Microsoft Excel. Upward compatible from SIM.xla (the Monte Carlo module in INSIGHT.xla). "Dr. Savage's Distribution Strings represent a major breakthrough in the communication of risk and uncertainty. It significantly widens the practical applicability of sound theory in these fields." "Sam Savage is the Edward Tufte of Risk." "Sam Savage is a rare expositor. He has a killer instinct for the heart of the matter and a fabulous talent for making it fascinating, easy, fun, and perhaps most important, profitable." The Remarkable Story of Risk"
Fools think he still lives! "A savage onslaught against the algebraic curtain..."
Dr. Sam Savage is an acclaimed author, educator and software developer in the field of Management Science. He is the founder and president of AnalyCorp Inc., a firm that develops executive education programs and software for improving business analysis. Savage is also a Consulting Professor of Management Science & Engineering at Stanford University. Before coming to Stanford, Savage taught at the University of Chicago's graduate School of Business for 15 years. Recently he has also been a Visiting Professor at Northwestern University's Kellogg School and the Naval Postgraduate School in Monterrey. In 1986 Savage received PC Magazine's Technical Excellence Award for his pioneering work in bringing management science techniques to the spreadsheet environment. The 2nd edition of his book, Decision Making with Insight, with Insight.xla 2.0, Analysis Software for Microsoft Excel has recently been published by Duxbury press. In a foreword to this work, Harry Markowitz, Nobel Laureate in Economics, writes: "Rarely has such sound theory been provided in such an entertaining manner... INSIGHT is a must read." Savage has also published in both technical journals and the popular press. Savage received his PhD in 1973 from Yale University in the area of combinatorial optimization (a fancy word for scheduling problems). After spending a year at General Motors Research Laboratory outside of Detroit, Savage joined the Management Science faculty of the University of Chicago Graduate School of Business. Here he discovered that an Algebraic Curtain separated his management students from management science. Two things ultimately dissuaded Savage from a career in music. First, there were a lot of people who were far better than he was. And second, they weren't making it in the music business either. In 1990, Savage moved to Stanford, where he currently teaches a popular course on Interactive Management Science using Excel. He is currently exploring the potential of various forms of on-line education. 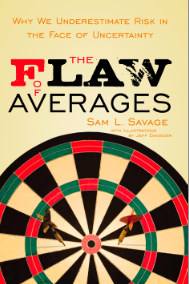 A common cause of bad planning is an error Dr. Savage calls the Flaw of Averages which may be stated as follows: plans based on average assumptions are wrong on average. Illustration from "INSIGHT.xla: Business Analysis Software for Microsoft Excel," 1st edition, by S. L. Savage, copyright 1998. Reproduced with permission of Brooks/Cole, an imprint of the Wadsworth Group, a division of Thomson Learning. Dr. Savage has assisted a range of industry and government organizations with their decisions related to risk and uncertainty. His unique approach, which he calls Disciplined Intuition, combines theoretical and experiential training to improve on-the-spot decision making. Unlike typical consultants who help clients to "catch a fish," Savage teaches enterprises to "catch their own fish." This has impacted the daily practices of these organizations, resulting in a material improvement in the way they now do business. Wells Fargo's California Regional Banking group has fundamentally changed the way it structures, markets and prices its retail products," says Senior Vice President, Matthew Raphaelson. "Business schools teach the theory and the math, but Sam's approach is intuitive and visual." Cineval LLC is a media-consulting firm in Los Angeles that advises film studios and their lenders on the value of their existing and future film libraries. "Sam helped us develop a simulation model using historical data that demonstrates the power of diversification in the movie business" says Cineval President, Rick Medress. The resulting Blitzogram interactive histogram is shown at right. The Leasing Exchange, a consortium of some of the largest lessors in the country, selected Dr. Savage to develop a course on Risk Modeling in Equipment Leasing. "Sam's perspective has given us new tools for looking at our world," says Townsend Walker, a director of the consortium who organized Savage's course. "Most of us had studied statistics and finance in school without putting it to practical use. Sam left us with a gut level understanding of the meaning of uncertainty and risk, and provided us with practical ways to measure and control them". Kaufman Hall is a financial advisory firm serving the health care industry. Their ENUFF Advisor® financial planning software is in use by more than 600 organizations throughout the country. "With Sam's training and a bit of his help, we were able to incorporate Monte Carlo simulations into our software and & processes." says founding Partner Mark Hall, "This has helped us evaluate Merger & acquisition opportunities, Alternative debt financing strategies, Short-term cash flow risk Managed care contracts, and Staffing strategies." Dr. Savage has also applied his expertise to modeling risky assets involving everything from petroleum exploration sites to entertainment investments. He has delivered numerous courses for the US Department of Defense, and has served as an expert in legal cases. "As a trial lawyer," says Greg Gallopoulos of Jenner & Block, a nationally pre-eminent litigation firm headquartered in Chicago, "I need technical experts who can take abstruse material and make it not just comprehensible, but entertaining, for the average person. That's what Sam does for statistical analysis." "Rarely has such sound theory been provided in such an entertaining manner. INSIGHT is a must read." "Against the Gods - The Remarkable Story of Risk"
"Sam Savage has given us an enormously practical way to use business analysis tools such as simulation, decision trees, and optimization. These tools are taught in many business schools but the approach is, alas, too often skewed toward the theoretical and many students feel uneasy making the transition to use them in actual business situations." "I need technical experts who can take abstruse material and make it not just comprehensible, but entertaining, for the average person. That's what Dr. Savage does for statistical analysis." Period B of civilization climaxed in the Industrial Revolution, which involved harnessing the power of physics. To grasp the power of physics with our hands often requires an industrial designer to develop an appropriate handle. Some important handles include the steering wheel, the light switch and the typewriter keyboard. My guess is that the boundary between biological and mechanical will blur, and our mindles will be wired directly into our nervous systems. Covers the basics of Monte Carlo simulation for modeling simple business problem. Includes diversification of investments, and optimal funding of a capital intensive project. Includes animations and a downloadable tutorial. See Optimize Magazine. Business Week article by Chris Farrell, January 22, 2001, in which Dr. Savage is quoted. Discusses the trend of using simulation to model retirement portfolios. Discusses the fallacy of assuming average returns on a retirement portfolio. Simple annuity models are available for download. Click here to read the article. Dr. Savage's html-based tutorial on the basics of Monte Carlo Simulation in Excel. Click here for the tutorial. For Additional Publications Visit Dr. Savage's Web Page at Stanford University. Formal education consists of reading, memorization and other cerebral activities. Yet many things as basic as riding a bicycle, can't be explained at all intellectually and must be experienced through the seat of the pants until they become intuitive. Most serious education requires both a theoretical and experiential perspective. Savage learned this in spades during flight training in a sailplane, where to survive he had to establish a dialog between the seat of his intellect and the seat of his pants. Unlike learning to ride a bike through trial and error, however, intuition into flight must be based on a disciplined regimen of theory and practice. Savage calls this Disciplined Intuition and it serves as his philosophy for analytical modeling. Today, with the aid of interactive spreadsheets, he provides a hands-on understanding of Management Science techniques, that only a few years ago were separated from Management by an Algebraic Curtain of arcane formulas. in New York, San Francisco, Chicago, and London! A Seminar presenting Dr. Savage's radical new approach to consolidating risks across an industry,enterprise or stock portfolio. It is based on the DIST Distribution String, developed in collaboration with SAS Institute, Oracle Corp., and Frontline Systems. Dr. Savage is assisting Royal Dutch Shell, and Merck & Co in applying it to investments in R&D projects. In addition, Morningstar has begun to explore its use in financial portfolios. You will leave this course with both a working knowledge of these methodologies and the software to begin applying them on your own. By generating tens of thousands of random numbers, computers can simulate uncertain future scenarios. The graphical output of these programs provides an intuitive feel for uncertainty not usually provided by the statistics you were taught in school. We have all heard that you shouldn't put all your eggs in one basket, but how many baskets should you use? You will learn how to create interactive graphs like the one at right based on historical data (in this case Hollywood film revenues) and evaluate the effects of diversification among investments. You may have heard the story about the statistician who drowned while crossing a river that was on average 3 feet deep. This is a classic example of what Dr. Savage calls the Flaw of Averages. Unfortunately the statistician's fate is analogous to what may happen when "average" values of uncertain numbers are plugged into financial plans. Simulating the financial plan not only maps out the river-bottom before you wade in, but also suggests the safest place to cross. Words like correlation and covariance do not adequately describe this important subject at the heart of investment theory, and furthermore they confuse people. Models based on raw data, on the other hand are often easier to understand and more adaptable than traditional methods. Classical statistical tests are being replaced by Berkson's Inter Ocular Trauma test which measures whether or not the evidence hits you between the eyes. "I found this complex subject matter as presented to be easily absorbed, eminently practical and immediately useful." "The seminar was stimulating, eye-opening, and of immediate value. Clear, practical examples provided effective guidance on how to tackle real-world problems." "Business schools teach the theory and the math, but Sam's approach is intuitive and visual. His tools work right in the spreadsheet, so most people can hit the ground running and bosses will have no trouble reading and interpreting the results." Senior VP, Wells Fargo & Co.
"This course pole vaults the student over a cross-bar of theory into a new understanding of the real financial world." "Sam's course was fun, but more important, valuable. In just a few hours I gained important and sometimes unintuitive insights into business planning that I could use in assessing and managing my firm's risks." Seminars start at 9 a.m. and conclude at 5 p.m. with a lunch break from 12 to 1. Morning and afternoon coffee breaks are provided but lunch is not included. For more information, call the AnalyCorp Seminar Office at (800) 400-2120. These seminars are accredited by the Illinois Department of Professional Regulation to provide 7 hours of CPE credit per day. They are also eligible for a maximum of 7 hours per day of Chartered Financial Analyst (CFA®) Continuing Education credits for members of the Association for Investment Management and Research. The seminars are structured to provide 7 hours of productive learning time per day. Members should consult AIMR's Continuing Education policy to determine the appropriate number of credits. Cancellations received more than three business days before the seminar date are subject to a $75 service charge. Cancellations within three business days of the seminar date are subject to the full fee. AnalyCorp Inc. reserves the right to cancel the seminar, in which case registrants will receive a full refund of the tuition fee.